2. consultations with the Conservation Advisory Group (CAG) occurred far too late in the design process – some considerable time after the earlier consultations with Design South-East and the Council’s Heritage Team, both of which pointed the developers, Mortar Nova in the direction of a modern design – inappropriately in our view after viewing the initial proposals. We acknowledge this delay was not Mortar Nova’s fault – they had apparently tried to arrange a presentation to CAG at an earlier date. Nevertheless we would have preferred a design which picked up important visual references from King’s House and the villas in Second Avenue, in terms of appearance, scale, character, proportion and form, which we think would have resulted in new buildings which would have fitted more sympathetically into the Conservation Area and related better to King’s House. After all, this is a very important and prominent site in a key location on Hove seafront. We had a number of discussions with the Mortar Nova and their architects Crowther Associates, at which we expressed these views, but it seemed then that our comments were received too late in the process to have any effect on the design proposals, which were well advanced at that stage. We were assured though by Mortar Nova that the final designs and images would look much better than the initial proposals that we had been shown. The planning application has now been lodged, (BH2018/00868), and I have to say we have been pleasantly surprised. The CGIs (Computer Generated Images) shown in the planning application documentation show a big improvement over the initial proposals. 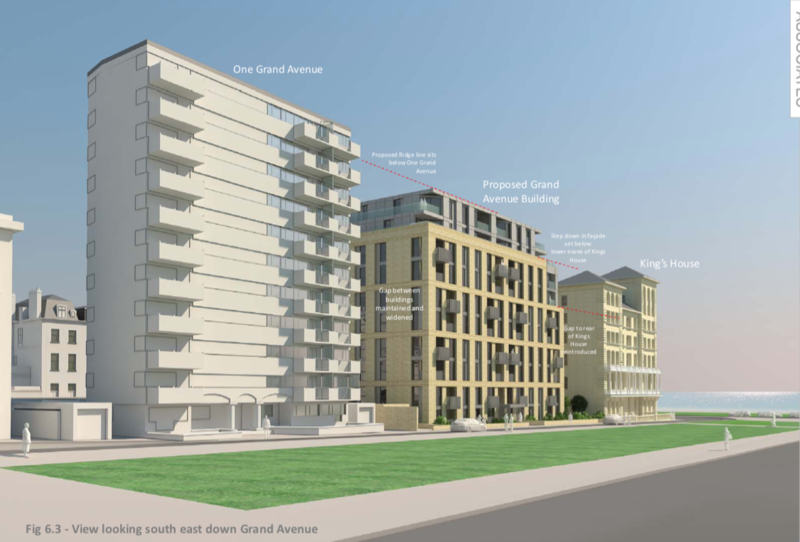 In Grand Avenue the new building appears to be much more polite, and relate better to King’s House and the existing tall buildings to the north of the site than the earlier drawings indicated. The view shown above looking down Grand Avenue (which was not included in the initial proposals), shows this well. In Second Avenue, the new building also relates better than the earlier design to the scale and appearance of the existing villas adjacent to the site – see the view below looking down Second Avenue towards the sea. 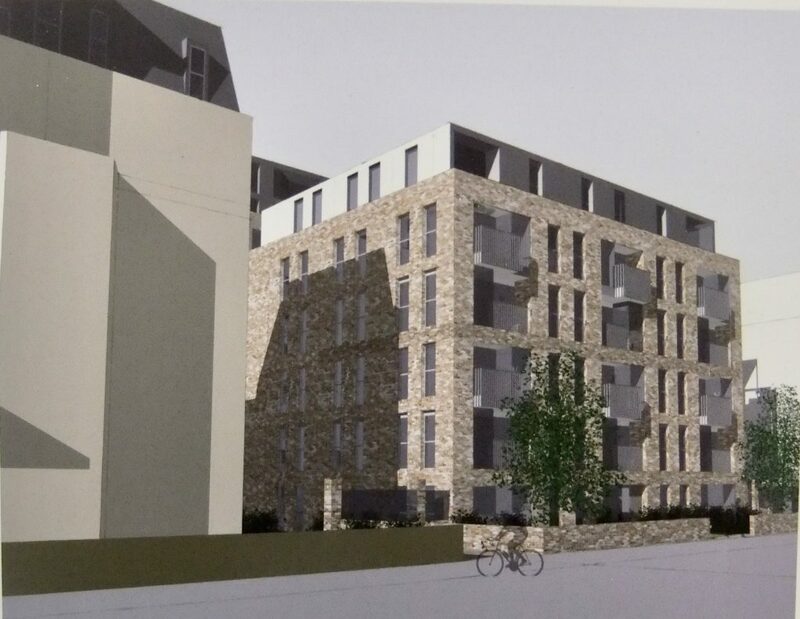 It is interesting how a few relatively minor changes to the images can make such a significant difference to the acceptability or otherwise of a new building proposal. Although not much has changed in terms of height, massing and bulk, the visual effect of the latest proposals submitted for planning approval is quite different. the top floor treatment on both new buildings is better articulated, more elegant and less dominant than it appeared on the initial drawings. the additional context information which shows the detail, the proportions, materials and scale of the adjacent existing buildings in both Grand and Second Avenues. We now feel much happier that these proposals will result in an overall enhancement to the area – which is of course one of the key criteria in evaluating whether new buildings in Conservation Areas are acceptable or not.